The Kiddygem Puzzle and Beep Fun Baby Playpen is not only attractive and beautiful in pink and white, but filled with toys and games to keep your baby busy for hours. It has a number of puzzles, beep buttons as well as gears and rollers that your child will love playing with, and will help in increasing their learning abilities. The product comes in 4 colors: blue, green, pink and brown. 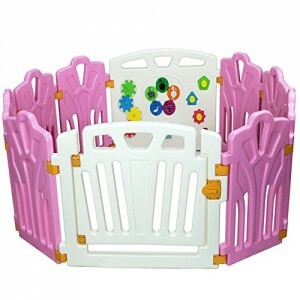 The playpen can be used as a ball pen or a safety gate, according to you and your baby’s need. You can also use it for your baby to sleep in on a mat if you are worried about them rolling over. It can also be used outside the house as a play yard on the days that you prefer to enjoy a beautiful day. The playpen consists of 10 separate panels that you can assemble and provide ample space for your child to play inside. 2 large panels for the gate and the game board along with 8 other smaller panels make it easy for you to create any shape you want for your child, be it a square, pentagon or rectangle. It is easy to assemble and creates a space of 12.69 square feet inside for your toddler to feel perfectly at ease. If you want to make the playpen bigger, it is always possible to add more panels to it by ordering extra. The playpen is perfect for a bigger child or two smaller children to play side by side, but a bigger one can accompany more children more comfortably. The same playpen can be used in a number of ways, whether you want to keep your baby confined inside or to keep them from wandering outside. It can be used to create a safe place for your children – more than one – to play together or to host a small play date for your toddler. 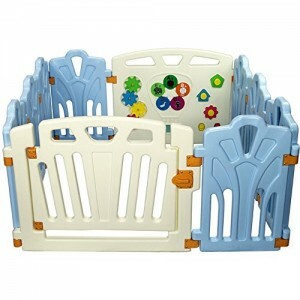 The playpen can be used anywhere and everywhere around the house, even taken away on trips. The play area inside one set might prove to be too small if you want your child to move around freely. In that case, it might be a better idea to buy two complete sets or additional panels to make the playpen bigger and more comfortable.